Study and training can open up doors to further opportunities, to help you reach your goal. There are many different pathways you can pick depending on your time, budget, and interest. Whether it be completing senior secondary, studying at university, or doing a TVET course… The right path is out there for you! Secondary education, which starts at Year 9, is the first turning point of your student life. This is when you should start thinking about what you want to do in life, what you are passionate about, and what subjects in school will enable you to fulfil your dream. Secondary education in Fiji is free and you should capitalise on this national initiative. If you have dropped out of school and are above the schooling age, it’s not the end of the world. There are options for you. Some schools like Nabua Secondary in Suva offer “Matua Classes” – these are for those who had dropped out of school, are of mature age, but willing to get back to school. You can re-join school too. Contact the nearest school in your area and find out. Technical and Vocational Education and Training (TVET) is education and training that gives you knowledge and skills for work. TVET courses are offered through Ministry of Education’s (MOE) Technical Colleges and by MOE recognised vocational education and training providers. 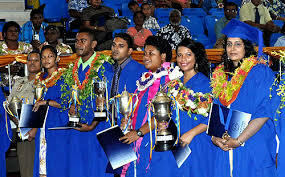 Popular ones include the Fiji National University’s National Training and Productivity Centre, Pacific Technical and Further Education at USP, Monfort Boys Town, and Centre for Appropriate Technology and Development at Nadave etc. But there are other organisations as well, including commercial schools and registered training organisations. A common practice in our Australia is that students take TVET courses while doing their secondary education. This gives them the leverage to get into the workforce as soon as they complete secondary school. However, this is an option and it is entirely on you how you want to craft your career. There is a wide range of courses available to you, just simply pick what you are interested in. The advantage of doing a TVET course during secondary education is that it sets you up right away for work. So you want to do some more study? There are endless opportunities to choose from depending on your individual situation. Whether it be university or TVET courses, there is a path for you to achieve what you want to achieve! University is the highest-level institution of study. Universities offer qualifications from certificate to undergraduate degrees to postgraduate degrees. There are 3 universities in Fiji: University of the South Pacific, Fiji National University, and the University of Fiji. For direct entry into a bachelor’s degree programme, all universities require a minimum of 250/400 marks in Year 13. However, there are alternative pathways available for those who do not meet this requirement. A good pathway is the TVET pathway. Graduating with a TVET certificate or diploma will help in getting entry into a bachelor’s degree programme. Check out the options available to you with TVET providers (link this). The government has in place schemes to support your tertiary studies. Click on the links below to find out.